Step away from civilisation for a while to the surreal landscape of the dunes, a unique world just waiting to be experienced! Covering 78 square kilometres, the traditional home of the Worimi people is the largest sand mass in the Southern Hemisphere. Here you will find everything from Aboriginal cultural sites to the skeletal remains of shipwrecks, WW2 fortifications and the hidden, remote outpost of Tin City. Then for a fun filled activity for all ages why not try a Sand Boarding Adventure? 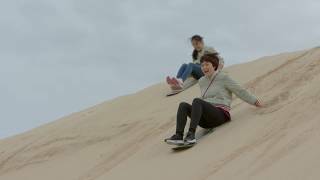 Enjoy the thrill of sand boarding down 60 degree slopes that are 30 metres high! Best of all there is no time limit.. stay and play in this amazing environment for as long as you like! Experiencing the vast dunes is truly awe inspiring, and they are a photographer's paradise so don't forget your camera!